Leicester City will pay the Football League £3.1m after settling a Financial Fair Play (FFP) dispute from the 2013/14 season when the club won the Championship. 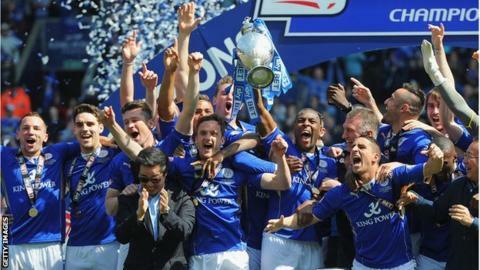 The Foxes exceeded the permitted £8m loss when they won promotion. They posted a loss of £20.8m but said £13m of it was "allowable" as it included promotion and academy costs. The EFL said that Leicester "did not make any deliberate attempt to infringe the rules or to deceive". It added: "The dispute arose out of genuine differences of interpretation of the rules between the parties." Leicester, who won the Premier League in 2015-16, could have faced a fine equivalent to the amount they exceeded the permitted £8m loss, in their case up to £12.8m. The Foxes had legally challenged the charge of breaching FFP rules, but proceedings were halted pending the outcome of a legal challenge by Queens Park Rangers in May 2015 that is ongoing. Bournemouth were fined £7.6m for breaching FFP rules in their 2014-15 promotion-winning season. Sides that breach FFP rulings not promoted to the Premier League can face a ban on transfers. Championship sides Bolton, Fulham and Nottingham Forest were all placed under a transfer embargo after breaching Football League rules in 2014-15.